Trench 2 continues to reveal some interesting features including possible structural elements and evidence of some type of fire, set directly on top of a horizontal slab of stone. Features immediately to the northwest of Trench 2. Read on for a full report and the latest digital images. Dry and sunny weather during the past week has resulted in good progress being made at the High Pasture excavations. Trench 2 is now in the region of 3 metres deep and we have uncovered the edge of the limestone bedrock on the east side of the cut feature, which we hope will prove to be one side of the former entrance passage into High Pasture Cave. Immediately on the west side of the limestone we revealed a mass of stonework, some of which appears to be structural with upright slabs and capping stones. 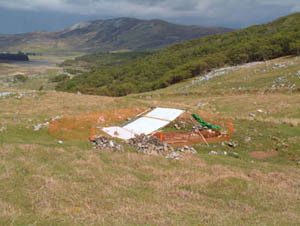 This may be associated with the formalising of the entrance into Bone Passage during prehistory and may be collapsed walling with possible corbelling resting on top. Unfortunately, the extent of Trench 2 has failed to reveal the opposite side of this feature, so before removing any of this material we will have to extend the trench. This will involve the removal of a significant amount of sediment and stone, so that we can investigate the structure in more detail. This should eventually allow us to continue our excavations to access Bone Passage. 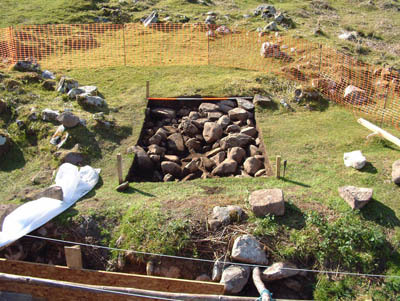 The fill of Trench 2 associated with this stonework contains well-preserved animal bone in some quantity, very similar to the material we recovered from our work in Bone Passage during 2004. This includes cattle, red deer and pig. However, there is little charcoal in this context or more domestic types of artefact such as pottery or bone tools, such as was foundin 2004. One important find made to the side of the stonework is however intriguing. In one small area adjacent to the tumbled stone we found at least five fragments of quern stones, two of which refit back together to form a small saddle quern. Rotary and saddle querns are often found associated with the backfilling materials recovered from the excavation of souterrains, usually near to the entrance to these structures. It has been suggested that these items may be some form of votive offering placed in these locations when the souterrains are ‘closed’ and further access denied. 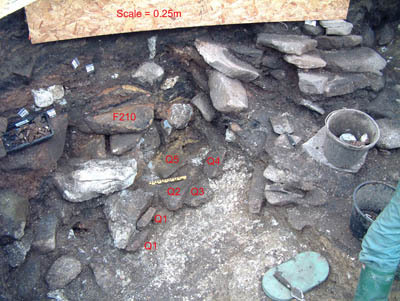 One other interesting feature uncovered in this part of the trench is feature F210, which is shown in the image above. F210 marks a flat slab of stone on which we uncovered a layer of orange/yellow clay around 30mm thick. Domed over the top of this feature is a complex sequence of clay-like lenses, of orange and yellow colour. The darker material in the feature comprises charcoal-rich material. This must have been some type of fire-setting on top of the rock slab. Post-excavation analysis of samples taken from F210 will hopefully provide more data as to the potential function of this feature. With space become limited working in the bottom of Trench 2, it was decided to open a new trench on site. 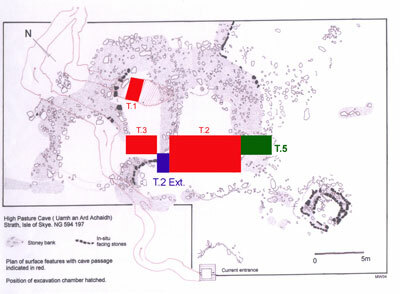 Trench 3 measures 3m x 2m and is located between trench 2 and the roundhouse, extending up to the proposed entrance to this structure. The new trench will investigate the NW side of the pit containing the entrance into Bone Passage and will show if the use of the roundhouse was contemporary with that of the entrance to the cave. In particular, the trench has been positioned to see if the steps uncovered in Trench 2 rise up to the level of the roundhouse. Trench 3 was positioned in a level grass-covered area. After removing the turf we came down onto a dense layer of stone comprising granite boulders interspersed with fire-cracked stone fragments. 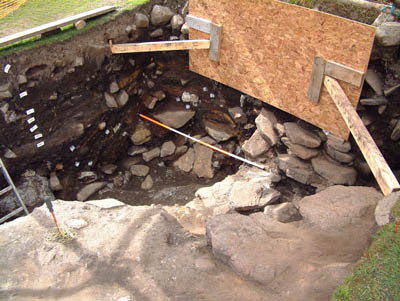 The soil between the stones was quite clean and no artefacts were recovered - prehistoric or later. However, after cleaning up the stone running down the north side of the trench seems to relate to a tumbled wall, running from the north side of the roundhouse entrance towards Trench 3. Looking to Trench 3 from above Trench 2, showing the mass of stone uncovered and the roundhouse beyond. We will post up new images and information as work progresses next week.